Line a 12 cup standard muffin pan with baking paper and set aside. In a small bowl mix the cinnamon sugar ingredients and set aside. In a large bowl mix the wet ingredients using a whisk until all ingredients are well belnded. In a smaller bowl, whisk the dry ingredients together. Add the dry ingredients into the wet ingredients and using a rubber spatula, gently mix the batter together, do not over mix it and do not worry about some lumps in the batter. 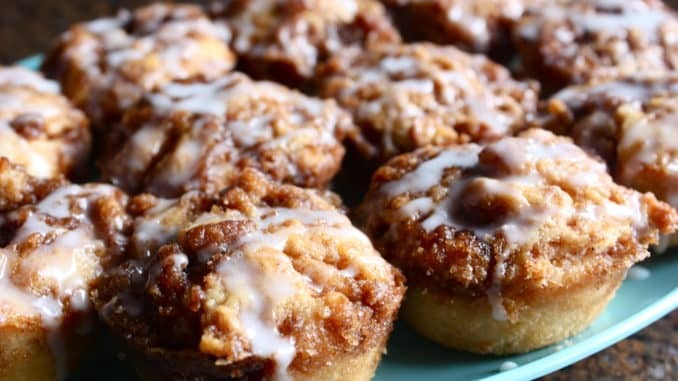 Using a tablespoon measure, place 2 tablespoons of batter at the bottom of each muffin cup, top with a teaspoon of cinnamon sugar mix and then top with a tablespoon more of batter.